It’s not often (at least not often enough!) that Kansas City has a team vying for a championship. But on Saturday, we will have just that as Sporting KC takes to the pitch against Real Salt Lake for the MLS Cup. When you consider Sporting’s humble beginnings back in 1996, when they played at Arrowhead Stadium as the Kansas City Wizards, their current position on the Kansas City landscape is remarkable. 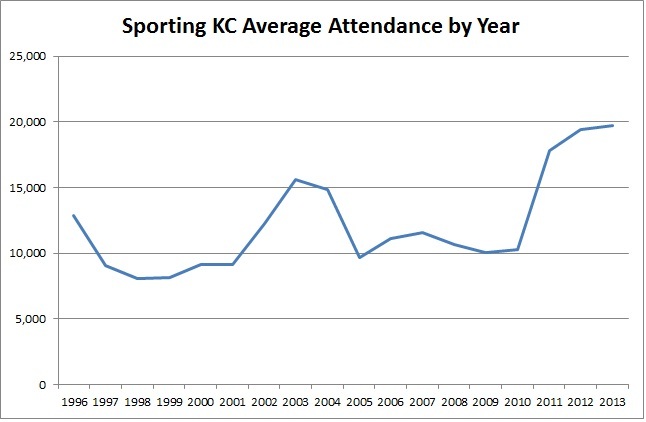 Sporting’s 2011 move to Sporting Park has vaulted average attendance to nearly 20,000. In the 2013 regular season, Sporting averaged 19,709 attendees per game or 107 percent of the stadium’s capacity. The new stadium has certainly helped create an atmosphere that attracts fans, but Sporting’s winning ways have helped keep the stadium full. The team has been a playoff staple in recent years, and Kansas City sports fans, hungry for a winning team, have responded by regularly selling out games. Sporting hosted the 2013 MLS All-Star game back in July, bringing in an estimated economic impact of $20 million to the region. This Saturday’s championship game will no doubt bring even more of an economic kick, not to mention the good press Kansas City will receive as a national television audience watches 20,000 chilled fans cheering Sporting on for one more win. Sporting has turned into a financial success as well. According to Forbes Magazine, Sporting KC is valued at $108 million (the seventh most valuable franchise in the league). Not bad considering the 10 original teams in the league cost just $5 million in 1996. Sporting’s success in recent years mirrors the league’s. Overall average attendance at MLS games exceeds both the NBA and NHL. New television money and plans for adding teams will bring the MLS to an even broader audience. When the Sprint Center opened in 2007, Kansas City sports fans were hopeful we would be awarded a third major sports franchise (either an NBA or NHL team). Although the Sprint Center has been a successful concert venue, that third franchise hasn’t transpired, at least not there. But, Kansas City did get its third franchise. They just happen to play at Sporting Park.